It's always encouraging to see Colorado Mesa University students giving back to the community — whether that is volunteering their time building houses for Habitat for Humanity or engineering electric ride-on cars for children with disabilities. The latest display of generosity came from CMU Greek Life. 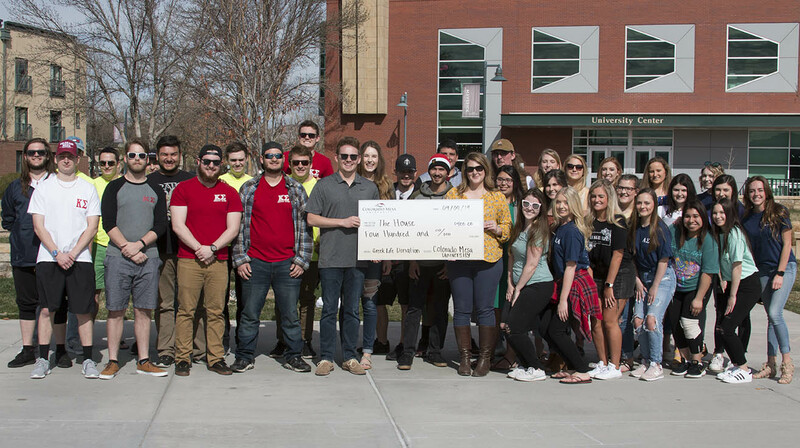 The Greek Executive Council (GEC), which is comprised of three fraternities and two sororities, recently gave $400 to a local teen homeless shelter called The House. The GEC won the $400 at CMU's homecoming parade held last October. Students were encouraged to create floats that best represented their club or organization. The Associated Student Government then gave cash prizes to floats that won first, second and third place. This money could be used towards funding for club activities. The GEC float took third place and $400. Since the prize money provided by ASG was for student clubs and Greek Executive Council is not a club but an organization, they instead decided to use the prize money to make a difference in the community. The GEC came to a group decision that the money should be donated to The House, a homeless shelter for teenagers in the Grand Junction community. On April 4, 2019, the CMU sororities and fraternities gave a big check to The House. When asked about her thoughts on the donation, Assistant Director of Student Life Gail Howe said, "I love that our students are supporting their peers." "I love that our students are supporting their peers." The House Volunteer and Development Coordinator Sharon Bouse-Ferry (wearing the yellow shirt) greeted the students and accepted the donation on behalf of The House. Bouse-Ferry is passionate about what she does and about the people she works with, and is thankful for the donation from CMU Greek Life. "Every dollar counts," said Bouse-Ferry. The donation will be used in many different ways including providing food, electricity and water to teens at The House. The Greek Executive Council's generosity shows what it means to be a CMU Maverick.